The easiest location to park is near the first set of steps by the mailboxes between the first and second buildings. From there you will take the stairs up to the court yard and turn right. Our entrance is the first door on the right. After you enter The Commons at Chadds Ford, proceed up the hill. Follow the drive to the left and go up the hill. Make another left and follow to the end where you will see spots for handicapped parking. After you park, follow the level sidewalk to the first office after the stairs. GPS users – Warning, some GPS’s will direct you to go to turn right on Harvey Road. DO NOT do this – there is not an entrance from Harvey Road. Please follow directions below. Take Wilmington Pike/RT 202 South towards Wilmington. Turn RIGHT onto Baltimo﻿﻿re Pike US-1 SOUTH. Along the way you’ll pass through one traffic light (Brandywine Drive/Hannum’s Harley Davidson Dealership on right). After ‘Southpoint’ (on right,) SLOW DOWN. Pass newer building and look for next entrance after the yellow sign for Harvey and Heyburn Roads. 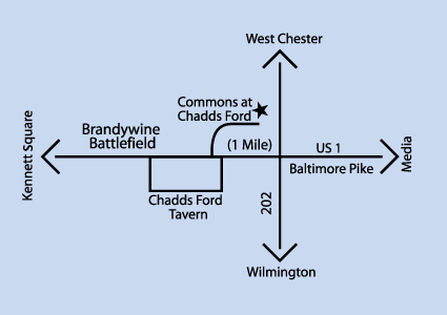 Turn RIGHT into The Commons @ Chadds Ford. Take Wilmington Pike/RT 202 North and cross into Pennsylvania. Turn LEFT onto Baltimore Pike US-1 SOUTH. Pass newer building and look for next entrance just after yellow sign for Harvey and Heyburn Roads. Pass newer building and look for entrance to the Commons just after the yellow sign to Harvey and Heyburn Roads. Go straight through intersection with RT 202. Pass the newer building and look for the entrance to the Commons just after the yellow sign for Harvey and Heyburn Roads. Take I-95 S toward CHESTER/PHILA INT'L AIRPORT. After the intersection of Rt 202 and US -1, Proceed EXACTLY 1 mile. Go PAST ‘Southpoint’ (on right) and SLOW DOWN. Pass the newer building and look for the entrance to the Commons just after the yellow sign to Harvey and Heyburn Roads.